Democratic politicians from Bernie Sanders to Andrew Cuomo have come out in favor of completely eliminating tuition and fees for students at public colleges and universities, but “centrist” publications like the New York Times and Forbes have lined up with more moderate Democrats, like Hillary Clinton, to criticize such spending plans. 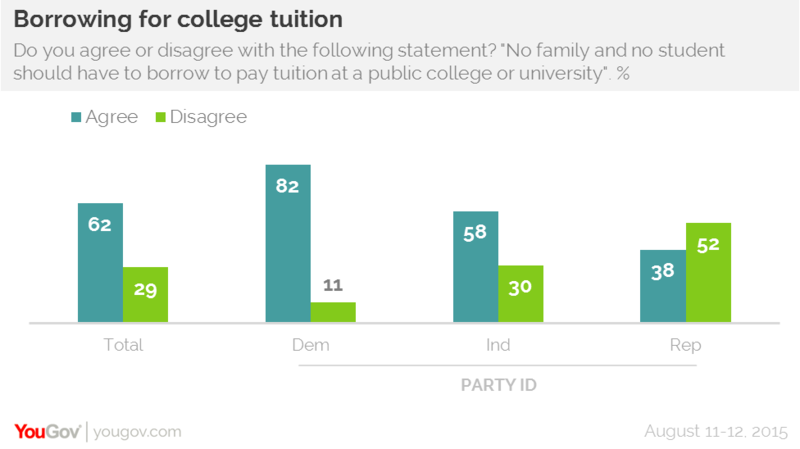 One persistent criticism of Bernie Sander’s plan to eliminate tuition and fees at public colleges and universities is that this is a policy that will disproportionately benefit the already-affluent. The argument is that since middle to upper class students are the main ones to attend college, any attempt to reduce fees will mostly benefit those same groups. They continue that existing programs like FAFSA are better because they are more targeted to students who can demonstrate unmet financial need. One of the largest problem that students from low income families find when it comes time to apply for financial aid is a lack of cooperation and assistance from their parents. The tax returns of low income families are more likely to be delayed or incomplete, and the parents are less likely to help out – sometimes because they’re unwilling, and sometimes because they just don’t have enough financial knowledge themselves. Pell grants are currently capped out at $5,950 per year, but according to scholars at the Pell Institute, it would need to be closer to $13,000 to have kept up with tuition inflation. To meet the balance, most students turn toward student loans that are either explicitly or implicitly subsidized by the government. Those students with the largest demonstrated financial need may be eligible for reduced-rate loans, but they’ll also struggle to get their parents to cosign. There is absolutely no doubt: the lower your family’s income is, the more likely you are to graduate with a pile of debt. We like to think of America as being a place of meritocracy and opportunity, but things have shifted over the last few decades – and your parent’s economic class has more and more impact on your own. Middle and upper class parents can afford to send their children to fancy prep schools and help pay for college tuition. Lower income students will have to take out loans, directly from the government. Then, for ten to fifteen years after they’ve graduated, these lower income students will be paying back their loans straight to the government. A normal tax would be levied on the people who earn the most income: this current arrangement levies the fee directly on to people who are using education to move up the social ladder. Yet another constant criticism levied from the right wing is that we “have too many college students.” There’s absolutely no evidence for this since the lowest paid four-year college graduate still makes significantly more than the best-paid blue collar technical workers. But there is a point: not everyone needs or wants a four year degree and some people would rather follow a vocational track. And the fact is, the vast majority of all vocational education programs are taught at local community colleges that would be covered under Bernie’s free college plan. Americans tend to rate their government poorly and complain about wasteful spending, but study after study shows that this is largely because the things our government does spend money on aren’t particularly aligned with voters’ interests.